Raised center curb and hazard marker. Small rural communities often lack the expertise and resources necessary to address speeding and the challenge of slowing high-speed through traffic. Entrances to communities are problematic because drivers must slow from a high-speed, often-rural roadway to a low-speed community setting, many times with pedestrians, bicycles, and on-street parking. Researchers at the Midwest Transportation Center (MTC) at Iowa State University have examined several methods of traffic calming along main roads through small Iowa communities. While traffic calming treatments have been evaluated on lower-speed U.S. urban roadways, little information is available on traffic-calming techniques for a high-speed rural highway entering a small community. The MTC researchers studied various countermeasures to speeding and summarized the advantages and disadvantages, effectiveness and appropriateness, and the costs of each, and made the information available to local decision makers. A series of three transverse speed bars spaced at intervals were applied to the pavement across the lane and upstream of the first speed limit sign entering the community. A red rectangle-shaped box with the corresponding speed limit within the box was applied on top of the pavement at the community entrance. A year later, “dragon’s teeth” were applied to the pavement upstream of the red box to bring more driver attention to the box. Two-inch-tall temporary curbing was applied down the middle of the road at three locations in one community. The curbing, which was bolted to the pavement, creates a sense of narrow lanes that tends to slow down drivers. Radar-activated LED speed limit signs were installed at the entrances of two communities. These signs, the size of a normal speed limit sign, have white LEDs around their borders that light up when a vehicle travels above a certain speed. A dynamic speed feedback sign was installed at one community entrance. Signs of this type display a message, such as “SLOW DOWN,” to drivers who exceed a predetermined speed. In most situations, the treatments were effective in small reductions in mean and 85th percentile speeds and were quite successful in reducing the fraction of vehicles traveling 5, 10, 15, or more mph over the speed limit. For example, the red box treatment with the corresponding speed limit within it resulted in decreases of up to 49, 60 and 100% for vehicles traveling at 5, 10, and 15 mph or over the speed limit, respectively. Firm conclusions, however, could not be drawn about whether the effectiveness of the treatments was due to the treatments themselves or to other factors. 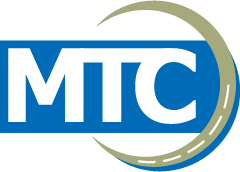 The information collected by the MTC does give local transportation agencies more information to make their community roads safer.